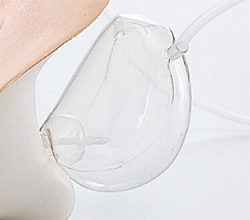 This "Transparent female catheter model" and "Transparent male catheter model" have been developed as a learning tool for both catheter simulation and anatomical study. 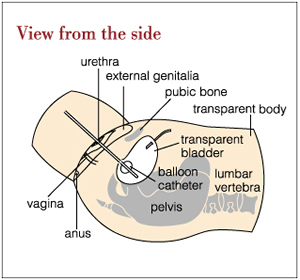 You can see from outside the inflation and position of the balloon for balloon catheter. Moreover, it is a catheter simulator using an external genitalia made of soft special material which makes it real as never before. The pelvis, bladder, etc. 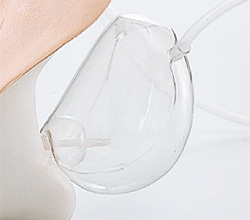 are built-in so you can learn while observing the state and angle of catheter insertion and its indwelling condition. The external genitalia is made true to nature. You can open the nympha, and the mucous plica etc. are very similar to the real thing. It is made so that you cannot find the urethra without opening the nympha. The pelvis is built-in. 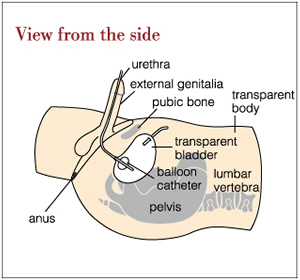 You can practice learning the catheter angle according to the bladder's position. The external genitalia is made true to nature.